Summary: When Brie’s older sister Faith falls off a mountain and dies, her family is plunged into grief as they struggle to understand what happened. As Brie tries to unravel the events leading up to Faith’s death, she’s also dealing with a cheating boyfriend, a best friend who would make a good enemy, and parents who are so overcome that they hardly notice her anymore. Thankfully Tessa, a Goth girl from school, takes Brie under her wing because she knows what loosing a sibling is like. Together, along with Alis, the brother of someone Brie didn’t know Faith was friends with, they will uncover the truth of Faith’s death to put to rest whether it was an accident or suicide. Review: Part mystery, part exploration of religion and faith as well as grief, Losing Faith by Denise Jaden is about two sisters who despite growing up together don’t seem to know each other very well. Raised in a family with religious beliefs, when Brie falls away from her faith and stops going to church the sisters drift apart. Faith’s belief in God takes its own turn as she gets involved with a cult with a charismatic leader able to hypnotise her followers. But Brie doesn’t know about Faith’s secret life, and the night she turns up dead, Brie believes she is at a local youth group meeting. Bit by bit, through Brie’s determination, Faith’s story unfolds after her death, and Brie is left wishing she had known her sister better while she was alive. Tessa ending up being my favourite character, because I thought she was well-developed. Living with a father who still believes she is six years-old because he’s caught up in past grief, Tessa lives with her own guilt and grief over her sister’s death. Her mother no longer lives with them, and any attempt Tessa makes to assert the fact that she has grown up is met with pretty serious denial and opposition. Dressing like a Goth is a way for her to make her outsides match her insides, and I loved how she gradually comes to embrace herself as she is again. The friendship that grows between Brie and Tessa is mutually beneficial in that respect. I don’t know what Brie would have done without her as Faith’s death makes her an oddity at school, but Tessa needs her too as Brie is a good, empathetic listener who helps Tessa sort through her emotional baggage. Though Jaden touches on bigger themes of what belief in God constitutes and how it is practised differently by various people, this friendship, more than the mystery and the cult aspect, was what kept me reading. Shoes too big and too small all at once. 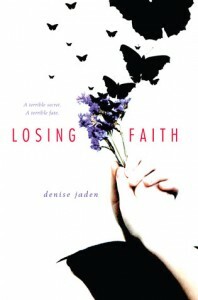 Losing Faith by Denise Jaden is published by Simon Pulse, (2010).